Set designer Kelly Angood is as good as they come when it comes to paper engineering. Last week I reported on her DIY pinhole Hassleblad camera she designed and made available for downloading. 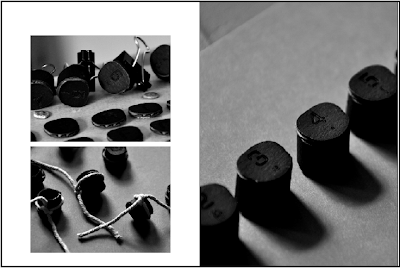 There is more—she has also created a totally functional replica of the adorable Olivetti Valentine typewriter—60s logomark and all. 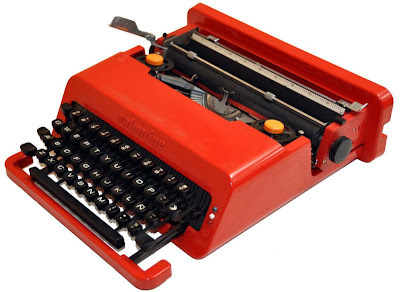 Using a cheap German typewriter for the interior guts and carriage, she encased it with a bright red corrugated cardboard framework to recreate the Valentine which was originally designed by Ettore Sottsass and introduced on Valentine's Day in 1969 by Olivetti. Angood then engineered an entirely functional paper keyboard, screen-printed the keys, fashioned metal parts with aluminum and used Lazertran, a waterslide transfer decal to recreate the ruler. Once her bright red gem of a typewriter was complete, she produced a monotone french-folded book to explain and document the entire production process. It has a red thread stitch binding and a flood of solid red tucked inside each folded page. 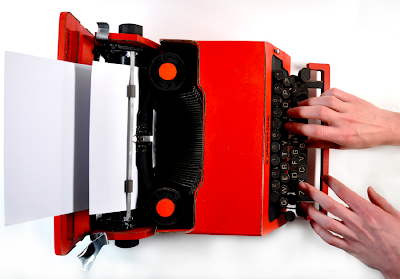 Angood's red replica marvel is a wonderful paper valentine to Sottsass and his jewel of a typewriter. Watch it in motion here. The original red Olivetti Valentine designed by Ettore Sottsass in 1969. He called his plastic portable typewriter an anti-machine machine. It also includes an exterior storage case which is not displayed here.